Exploring the freedom of expression that Science Fiction writing offers. 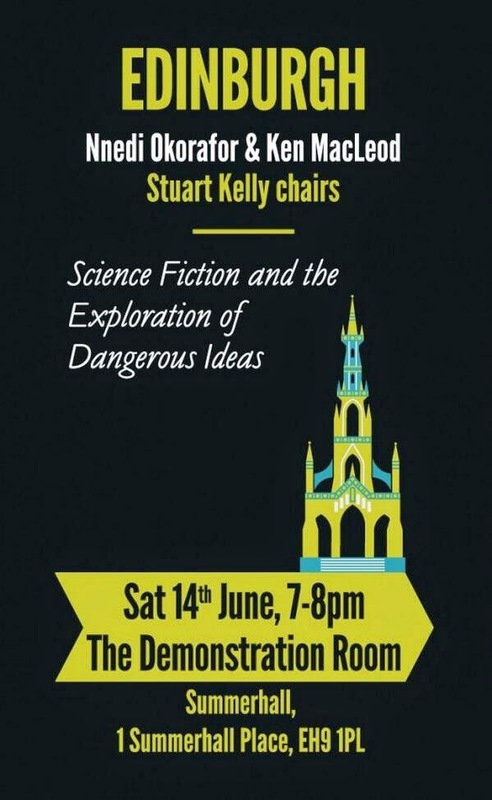 Nnedi Okorafor (Who Fears Death, winner of the World Fantasy Award 2011) and Ken MacLeod (Intrusion and most recently Descent) will discuss their favourite pieces of provocative SF from their own works and others followed by an audience Q and A, and signings. 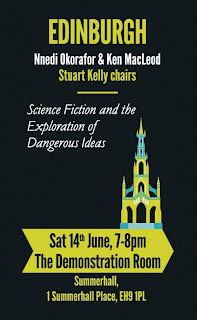 Event chaired by Stuart Kelly. My name is Scott Christopherson. I am a Documentary Film Professor at St. Edward's University in Austin, TX. Students from the University and myself are traveling to Scotland this summer from July 8-August 10th to make series of short documentaries about Scottish culture and identity. I recently read your piece in the volume, “Unstated: Scottish Writers on Independence” and really enjoyed it. My colleague, Innes Mitchell, is a native of Edinburgh. Broadly speaking, our collection of documentary films asks the question “What does it mean to be Scottish today?” Our film does not support any political philosophy or organization in any way, but we are interested in the referendum and what that means for Scottish citizens. Our short films aim to highlight a broad cross section of diversity among Scottish citizens. We hope to film and follow citizens from all walks of life, different ethnic and immigrant populations, different professionals, and different age groups. We want to show what life is like in Scotland today for its everyday citizens. We are very interested in showing what life is like for writers and poets and to hear your perspective as a writer. Please let me know if you have any other questions about our filmmaking process, our goals, or anything else. We will be in Edinburgh and Glasgow from July 8-August 10 this summer, 2014. Would you be willing to be interviewed and participate as a character in our film? Your voice as a Scottish citizen is unique and powerful and we would love to have such a well-respected and accomplished person as yourself in our film. Please email me at scottc@stedwards.edu.